News reports of a recent partial fossil skeleton find from Ethiopia’s Afar region, allegedly 3.6 million years old, and dubbed Big Man, is said to represent Australopithecus afarensis, the same species as the famous ‘Lucy’.1,2,3,4 However, it is unclear from the description of the fossil skeleton in these news reports whether Big Man’s assignment to the species Australopithecus afarensis has more to do with the alleged geological age of the fossil than its form. More specifically, if evolutionary assumptions are put aside, one can be left with the impression after reading these news reports that what has actually been found may be an ancient human skeleton instead, and not one representing Australopithecus afarensis. This would be quite significant indeed, and the purpose of this article is to explore the above intriguing possibility. If evolutionary assumptions are put aside, one can be left with the impression after reading these news reports that what has actually been found may be an ancient human skeleton instead, and not one representing Australopithecus afarensis. Homo erectus is generally considered to be human by most creationists. According to the authors the iliac fossa of Homo is described as exhibiting a “more pronounced sigmoid curvature” than in KSD-VP-1/1 and AL 288-1, the latter two said to be similar.17 However, it should be pointed out that a considerable portion of the iliac fossa appears to be missing, and also that in Homo erectus or ‘early Homo’ specimens the iliac fossa is described as shallow.18 Comparing some of the other cardinal characters preserved in the os coxa of KSD-VP-1/1, some fit better with the australopithecines, whilst others fit better with Homo. However, in some of the cardinal characters fitting better with the australopithecines, such as the anteriorly located iliac pillar, the character also fits Homo erectus or alleged ‘early Homo’.19 Hence, from information at hand about the pelvis, it seems that the possibility of Big Man having been a Homo erectus individual cannot be excluded. It seems that the possibility of Big Man having been a Homo erectus individual cannot be excluded. Yet other evolutionary experts have stated concerning the scapula of Australopithecus afarensis (AL 288-1) that this “specimen suggests that the glenoid cavity was cranially oriented in A. afarensis in a manner similar to that of the great apes and different from the lateral orientation found in humans”.32 Hence, it sure does not sound as if Big Man and Lucy were of the same species. Whilst Haile-Selassie et al. emphasize the uniqueness of the KSD-VP-1/1 scapula,33 from the orientation of its glenoid cavity and other features it seems, at least according to my understanding, to fit much better within the Homo erectus range than the australopithecine range. 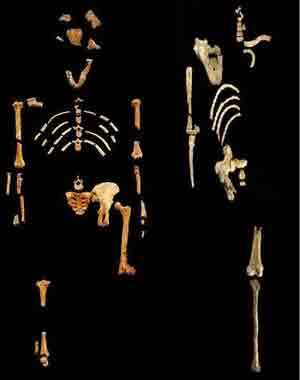 As for body size, KSD-VP-1/1 is described as “a moderately large-bodied (i.e., well within the range of living Homo in many aspects) partial skeleton.”34 Said to have “stood between 1.5 and 1.7 meters tall, about 30% larger than Lucy”, it is well within the human range, and considerably larger than Lucy.35 Concerning Big Man, Ann Gibbons notes the authors as saying that the “curvature of the second rib suggests a wide rib cage at the top and a barrel shape overall, similar to that of modern humans and distinct from the more funnel-shaped rib cage of a chimpanzee”.36 Lucy’s rib cage has been described as being conical-shaped (i.e., funnel-shaped) by an evolutionary expert.37 Hence, the difference in body size and rib cage structure indicates that Big Man was not an australopithecine like Lucy, but more likely an ancient human. Given the ‘dating’, evolutionists cannot even consider the possibility of Big Man being a Homo erectus specimen, as that would essentially bring the whole human evolutionary edifice tumbling down in a heap of bones. A left distal femur was preserved, and the authors used the crural index (tibia/femur length ratio × 100) to crudely estimate its length, based on the assumption that it “is stable in hominoids”.41 Big man is said to have “long legs” according to the authors,42 which is consistent with it being human. However, with the only relatively complete limb bone being the left tibia, one has to be cautious about saying anything too definite about limb proportions. No doubt there will be further analysis and publication on the preserved parts of the Big Man skeleton, and so caution is needed when interpreting this fossil find. However, one cannot help but feel that if Big Man had been ‘dated’ to around 1.6 million years ago, instead of 3.6 million years ago, evolutionists would be talking about an early Homo skeleton, probably Homo erectus, and certainly not Australopithecus afarensis. Of course, given the ‘dating’, evolutionists cannot even consider the possibility of Big Man being a Homo erectus specimen, as that would essentially bring the whole human evolutionary edifice tumbling down in a heap of bones. This is because in their scheme of things no supposed hominid as ‘advanced’ as that would be expected to have ‘evolved’ that early. Hence, to them Big Man has to be an australopithecine in order to preserve the evolutionary story, regardless of whether it looks like a Homo erectus specimen. In my opinion, it just does not seem feasible that Lucy and Big Man are of the same species, Australopithecus afarensis. Whilst the former can be classified as such, the latter (Big Man) seems to better fit the description of Homo erectus. If the skull was preserved, as well as the foot/ankle and hand/wrist bones, then that would unequivocally settle the issue, but these items were not recovered. If this is a Homo erectus skeleton, which seems likely, then from a creation point of view the question boils down to the identity of Homo erectus. 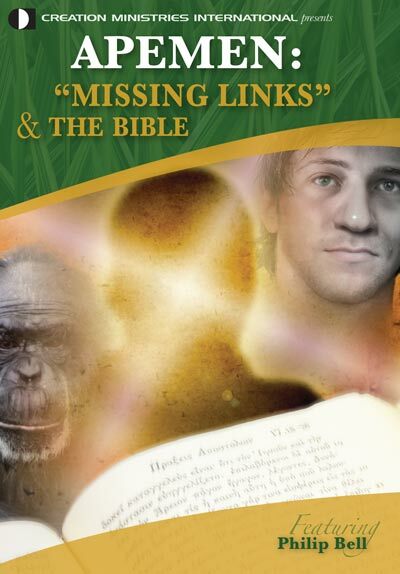 Along with many other creationists, this author believes that fossils labeled as Homo erectus are in fact ancient humans, descendants of Adam and Eve, and so actually belong to the species Homo sapiens. Whether some of these ancient humans were actually buried during the flood, or subsequently after the post-Babel dispersion, is an important issue that needs addressing further. The latter option is generally assumed by most creationists, myself included, but the former possibility also needs to be considered, or at least definitely ruled out. This is important, because it relates to the interpretation of some of the skeletal features observed in Homo erectus. There are many potential explanations as to why fossils labeled as Homo erectus on average have differences in certain skeletal features compared to modern humans, as indicated in regards with Big Man. Gibbons, A., Lucy’s ‘big brother’ reveals new facets of her species, Science 328:1619, 2010. Return to text. Dalton, R., Africa’s next top hominid: ancient human relative could walk upright, Nature News, 21 June 2010 (accessed 23 June 2010). Return to text. Keim, B., Lucy’s grandfather fossil makes humanity’s ancestor seem more like us, Wired, 22 June 2010 (accessed 26 June 2010). Return to text. Bower, B., Lucy fossil gets jolted upright by big man: partial skeleton suggests ancient roots for humanlike walking, Science News, 21 June 2010 (accessed 22 June 2010). Return to text. Haile-Selassie, Y. et al., An early Australopithecus afarensis postcranium from Woranso-Mille, Ethiopia, PNAS USA 107:12121–12126, 2010. Return to text. Gibbons, ref. 1. Return to text. Haile-Selassie et al., ref. 5, p. 12121. Return to text. 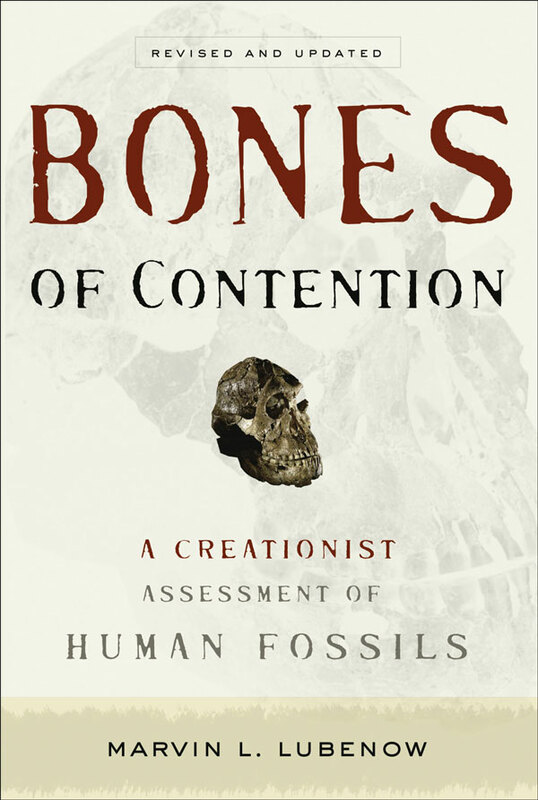 Mehlert, A.W., A review of the present status of some alleged early hominds, CEN Tech. J. (J. Creation) 6(1):15–18, 1992. Return to text. Cartmill, M. and Smith, F.H., The Human Lineage, Wiley-Blackwell, New Jersey, p. 158, 2009. Return to text. Haile-Selassie et al., ref. 5, Appendix Supplement, Figure S6, p. 8. Return to text. Haile-Selassie et al., ref. 5, Appendix Supplement, Text Note S2, p. 2. Return to text. By ‘early Homo’ evolutionists are usually referring to alleged hominids designated to the genus Homo that are age dated by them to roughly the early Pleistocene period, but whose specific species affinity is not stated or is uncertain. Some of these alleged hominids are unlikely to have been human, such as certain Homo habilis specimens, whilst others (i.e., Homo erectus) most likely were ancient humans (descendants of Adam and Eve). Return to text. Simpson, S.W. et al., A female Homo erectus pelvis from Gona, Ethiopia, Science 322:1089–1090, 2008; see also Figure S4, p. 16 of Supporting Online Material of the Simpson et al. paper. Return to text. Aiello, L. and Dean, C., An Introduction to Human Evolutionary Anatomy, Academic press, London, p. 447, 1990. Return to text. Haile-Selassie et al., ref. 5, Appendix Supplement, Table S3, p. 35. Return to text. Aiello and Dean, ref. 16, p. 453. Return to text. Simpson et al., ref. 15, p. 1090. Return to text. Haile-Selassie et al., ref. 5, p. 12122. Return to text. Dalton, ref. 2. Return to text. Haile-Selassie et al., ref. 5, pp. 12122–12124. Return to text. Haile-Selassie et al., ref. 5, p. 12124. Return to text. Aiello and Dean, ref. 13, pp. 353–354. Return to text. Haile-Selassie et al., ref. 5, p. 12123. Return to text. Berger, L.R. et al., Australopithecus sediba: A new species of Homo-Like Australopith from South Africa, Science 328:195–204, 2010 (see Supporting Online Material, Table S2, p. 16). Return to text. Berger et al., ref. 26. Return to text. Lordkipanidze et al., Postcranial evidence from early Homo from Dmanisi, Georgia, Nature 449:305-310, 2007 (see also Supplementary Table S4, p. 11). In the Tables given by the authors where the measurements of the shoulder girdle is described (Table 1 in main text and Supplementary Table S4) what seems to be the angle of the glenoid cavity relative to the mid-axillary border (axillary-glenoid angle), which is what the authors state in the text to be more cranially oriented than in modern humans (p. 306), is for some reason labeled confusingly as “olecranon orientation relative to midaxillary border”. Return to text. Haile-Selassie et al., ref. 5, pp. 12123–12124. Return to text. Haile-Selassie et al., ref. 5, p. 12125. Return to text. Aiello and Dean, ref. 16, p. 353. Return to text. Leakey, R. And Lewin, R., Origins Reconsidered: in Search of What Makes us Human, Abacus, London, pp. 193–194, 2010. Return to text. Haile-Selassie et al., ref. 5, p. 12122, 2010 (see also Appendix Supplement, Table S6, p. 41). Return to text. Haile-Selassie et al., ref. 5, p. 12125, 2010 (see also Appendix Supplement, Table S6, p. 41). Return to text.